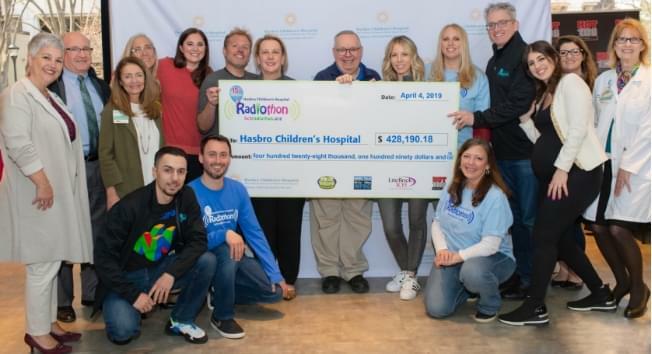 A heartfelt thank you to everyone who helped make the 2019 Hasbro Children’s Hospital Radiothon an incredible success. The outpouring of generosity from our local community during the 15th anniversary of Radiothon was nothing short of extraordinary. The Rhode Island and Southeastern Massachusetts community came together in an incredible way – donating $428,190.18 for the Hasbro Children’s Hospital during this year’s Radiothon in just one day! Lite Rock 105, 92 PRO-FM, Hot 106 and News Talk 99.7 FM & 630 WPRO are extremely proud to continue the tradition of the Hasbro Children’s Radiothon. From the bottom of our hearts, we thank you. There are still ways to donate including through the online donation center or by texting HASBRO to 68683. Your generosity truly makes so many wonderful things happen. All donations collected this year benefit the Hasbro Children’s Hospital and directly impact our local needs.